Saturday, October 15th: 9:00 am until Noon – Near Tuscarora Pike, west of Martinsburg. Take exit 13 from I-81, Turn west toward Poor House Farm on Tuscarora Pike. Go approximately 1.7 miles, loor for mailbox #8055 on the right. Turn right into the driveway. The holes are already dug for 140 trees. Saturday October 29th – To be determined depending on tree order arrival. 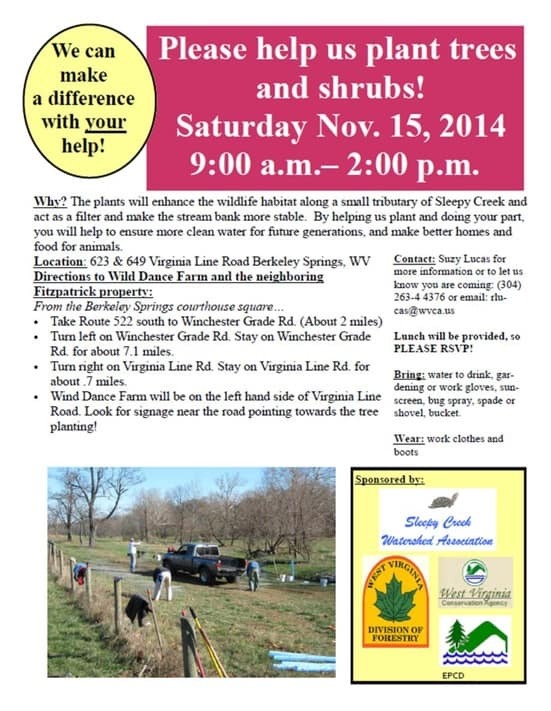 Saturday, November 5th – Planting at the “Crossing on the Potomac: HOA in north Berkeley County. Saturday, November 12th – “Tree 4 Bees” planting at Sacred Roots on Persimmon Lane in Jefferson County. 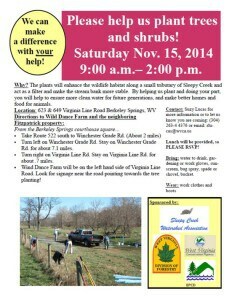 Saturday, November 19th – Riparian buffer planting on Back Creek of Ganotown Road. Herb will also have two other Tree 4 Bee planting he will schedule for weekdays or on October 2th. If you would like to help out with any of these tree plantings please contact Herb Peddicord at (304) 229-2665 or herb.f.peddicord. @wv.gov for more information. Participants at all of these planting should bring water to drink, gardening or work goloves, sunscreen, pub spray, and a spade or shovel. Work clothes and boots are also appropriate clothing. Community organizations and private homeowners are encouraged to apply to plant memorial trees throughout their communities and in their backyards. On your order form, you’ll need to select where you’ll be picking up your trees from, how many trees you are requesting, and answer some basic information about where you’ll be planting the trees and how they will be maintained. Please keep in mind that we will do our best to honor all requests for species, but in certain situations, a similar species may be substituted based on nursery availability. The deadline to apply for memorial trees is Wednesday, September 14th. 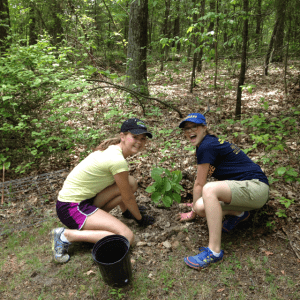 We encourage successful applicants to submit their tree planting with pictures to Cacapon Institute’s “What’s Your BMP” tool on our website. Please fill out a form at the Cacapon Institute website, www.cacaponinstitute.org and email it to ctree@cacaponinstitute.org or contact me with any questions. Building Communities from the Roots Up! 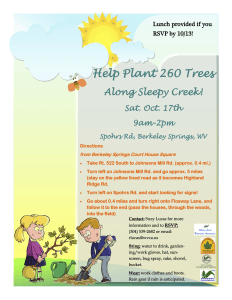 Join us for a tree planting on October 17th! Click on flyer to view full size. Upcoming SCWA events: Everyone welcome, join the fun! Eliza and Maya are happy volunteers! Interested in some short term outside volunteer opportunities? 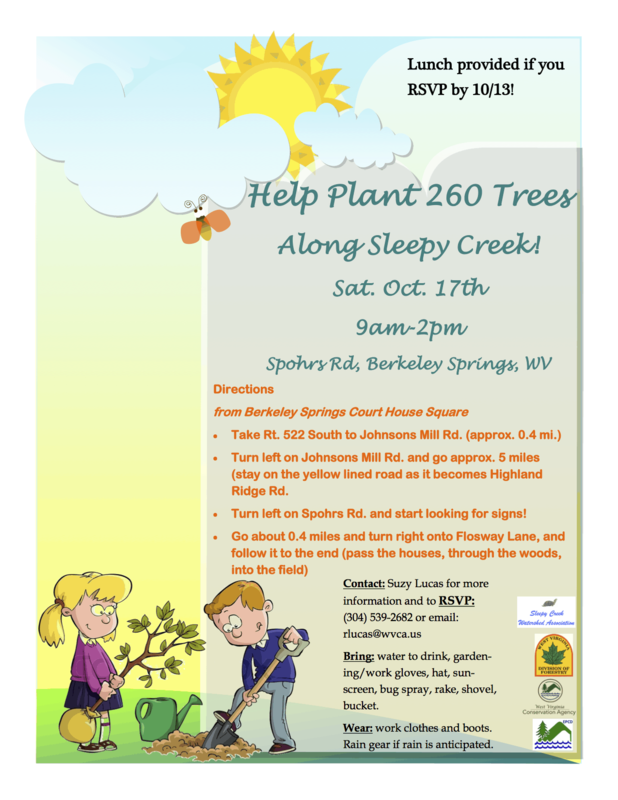 We could use some help and have partnered with several state and local organization to support the following tree plantings in the Sleepy Creek Watershed. Friday, September 25, 9 AM – 2 PM. On this day we will be planting 250 disease replacement trees at Cacapon State Park and lunch will be provided by the park to all volunteers. We will assemble at the main lodge for planting instructions and teaming. Please bring a shovel or small spade and gloves. For more information, please call Suzy Lucas at 304-263-4376, extension 3, to volunteer. In particular, the Cacapon Institute will support your participation in the September 22nd trip tentatively scheduled from 10 AM to 3:30 PM between Great Cacapon, WV and Hancock, MD by providing kayaks and or/canoes and carpooling between Hancock and Great Cacapon as needed. Parking is available at the Cacapon Institute, 10 Rock Ford Road, Great Cacapon, WV (weather permitting). Parking is also available at the C&O Canal Park at the bottom on South Pennsylvania Street in Hancock, MD. If you are interested in participating, please register with the Cacapon Institute at 304-258-8013, or call Frank Rodgers at 304-258-7657 or email him at FRodgers@CacaponInstitute.org. Frank will provide you additional details as the time nears. After much planning and a week of prep work, hundreds of trees were planted in the Old Mill Manor area along Sleepy Creek on Saturday. Tuesday was hole digging, Wednesday, unloading the trees from a semi. and delivering them to the planting sites, Friday making the deer-proof cages and distributing them to the sites, and on Saturday we were ready for 18 people to plant hundreds of trees. 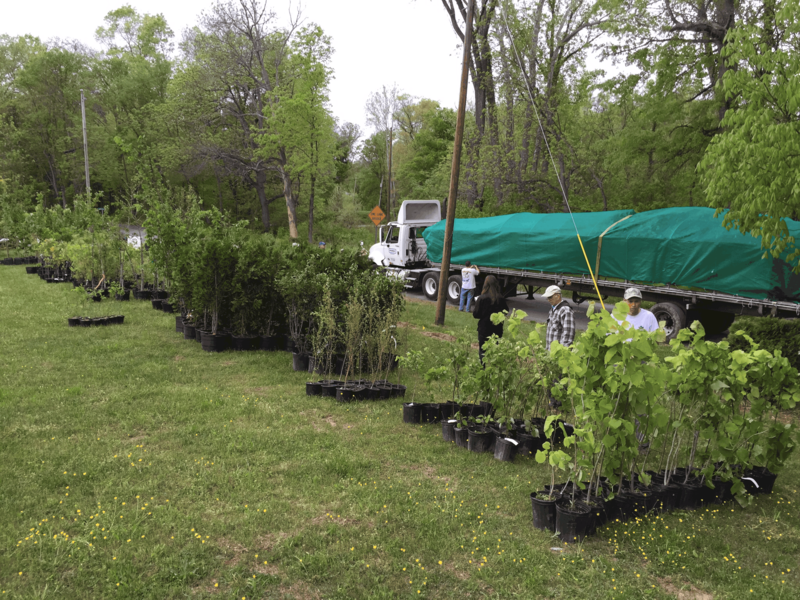 Some of the varieties of trees and bushes planted: Black Walnut, River Birch, Basswood, American Elm ,Red Maple, Swamp Oak, Sweet Gum, Yellow Poplar, Flowering Dogwood, Red Bud, Button Bush, Hazelnut, and Viburnum. We got the last stakes pounded in about 3:30, and it started raining within a half hour later. Thanks to everyone for all the help, it was really a team effort. Finished with the first 20, only 300 to go! Come join us for a fun day of tree planting! Students and Girl Scouts Planting trees at our last tree planting event. register and reserve your lunch. We hope to see you there! 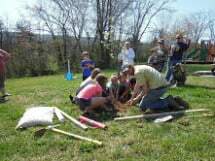 Tanner Haid from Cacapon Institute teaches and participates with students and Girl Scouts in planting trees at Greenwood Elementary School on April 18th. The trees were paid for by the US Forest Service through WV CommuniTree whose objective is to improve the environmental quality and ecological impact of public lands by promoting tree planting and education through volunteerism in the Potomac Headwaters of the State of West Virginia. The weather was perfect, and with all the volunteers, the planting went very smoothly. Thanks to all the groups that planned and participated in this event! It’s all smiles at the CommuniTree Planting at Greenwood Elementary! 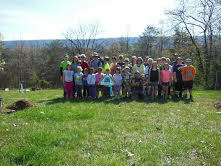 Forty adults and children from the Sleepy Creek Watershed Association, Cacapon Institute, Greenwood Parents and Teachers Association, and Girl Scout Troop 40764 planted 16 shade and flowering trees at the school last Saturday, April 18th. WV CommuniTree is funded by the US Forest Service. Its objective is to improve the environmental quality and ecological impact of public lands by promoting tree planting and education through volunteerism in the Potomac Headwaters of the State of West Virginia. More than 30 hearty souls showed up on a cold November morning to plant 196 trees and shrubs at and adjacent to Wind Dance Farm near Berkeley Springs. 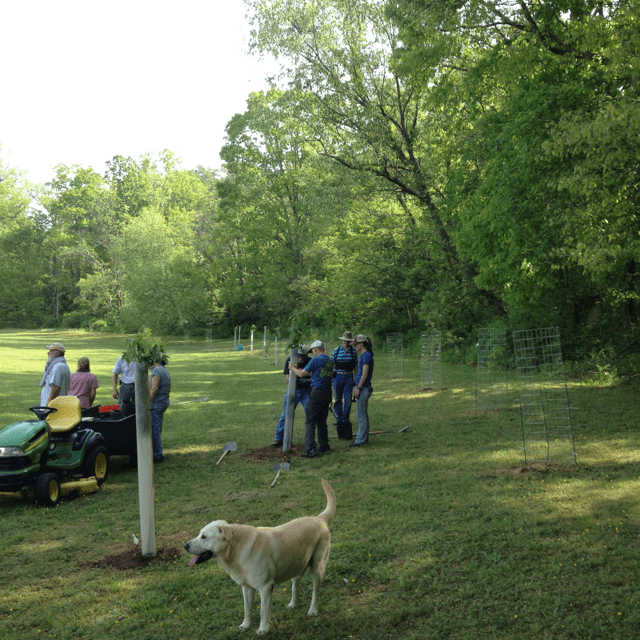 Everyone worked hard, and had fun planting the trees and installing deer-proof tubes for protection. SCWA provided a nice bag lunch and combined efforts with the WV Dept. of Forestry and the Eastern Panhandle Conservation District to make the event a success. Thanks to all the volunteers and organizers, there was a very fun atmosphere, and we got all the trees planted by mid afternoon. Help us protect this unique natural resource.